CANTON, Mass. (July 8, 2013) – This month, guests who dash into Dunkin’ Donuts to keep running with Iced Coffee or other favorite food and beverages might walk out with $1,000 in cash and a host of other cool summer surprises. To celebrate both Iced Coffee season and the introduction of the brand’s new Original Blend Iced Coffee K-Cup® packs, Dunkin’ Donuts, America’s all-day, everyday stop for coffee and baked goods, today launched “Iced Coffee Cash & DDash.” Beginning today, at least one Dunkin’ Donuts guest somewhere in the United States will be surprised each weekday in July at the front counter with $1K in “ice cold hard cash,” a month’s supply of Dunkin’ Donuts Iced Coffee, a Keurig® K-Cup® Brewing System, and a box of Dunkin’ Donuts’ new Original Blend Iced Coffee K-Cup® packs. A total of 25 guests throughout July will be surprised with the Iced Coffee Cash & DDash prize. There is no purchase necessary and the program is open to legal U.S. residents residing in the fifty (50) United States and the District of Columbia, who are eighteen (18) years of age or older. For additional terms and conditions related to Dunkin’ Donuts’ Iced Coffee Cash & DDash, please visit: http://www.dunkindonuts.com/content/dunkindonuts/en/promotions/Iced_Coffee_Cash_DDash_Promotion.html. Dunkin’ Donuts is the place to keep running all day long with Iced Coffee, both at home and on the go. Guests can customize their Iced Coffee in Dunkin' Donuts restaurants to be just the way they like it, with many different dairy, sweetener and flavor options. Dunkin’ Donuts is the market leader in the Iced Coffee category, delivering refreshing Iced Coffee to guests every day, with a consistently smooth, delicious taste. The brand has been at the forefront in developing an innovative process for brewing Iced Coffee, which has set the standard for the industry. The unique process, called double brewing, uses twice the amount of coffee when making the beverage so that it's never watered down, which achieves consistent flavor and freshness that are never compromised at the expense of serving it cold. For a home ice advantage, this month Dunkin’ Donuts introduced Original Blend Iced Coffee K-Cup® packs, a new variety of the brand’s popular K-Cup® packs for use with the Keurig® K-Cup® Brewing System. Specially crafted to deliver the great taste of Dunkin’ Donuts’ delicious and refreshing Original Blend Iced Coffee in a single-serve portion, at the touch of a button. Iced Coffee K-Cup® packs are brewed hot directly over ice, delivering the smooth, delicious taste that’s made Dunkin’ Donuts America’s Favorite Iced Coffee. 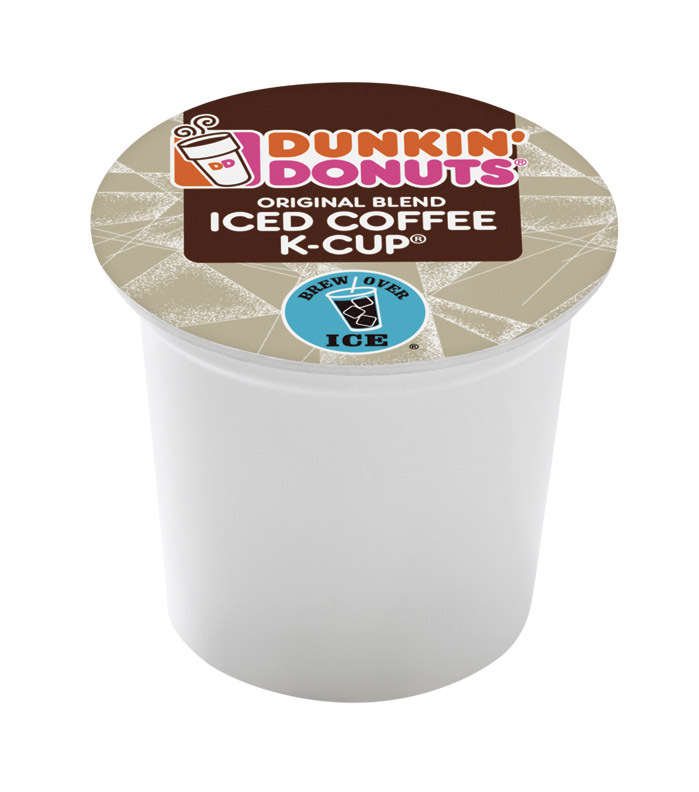 Dunkin’ Donuts’ Iced Coffee K-Cup® packs are recommended for use with the 6 oz. or 8 oz. brew setting. The Iced Coffee K-Cup® packs are available through August at participating Dunkin’ Donuts restaurants nationwide. Sold exclusively at participating Dunkin’ Donuts restaurants, Dunkin’ K-Cup® packs are offered in a 14-count box in five popular flavors, including Original Blend, Dunkin’ Decaf®, French Vanilla, Hazelnut and Dunkin’ Dark® Roast. Keurig® single cup brewers for use in-home and in the office utilize patented, innovative brewing and single cup technology to deliver a fresh-brewed, perfect cup of coffee, every time at just the touch of a button.